At some point in our lives, we’ve all had that well-meaning friend who insists that we would be a great match for someone they know. It’s a story that usually ends in, “Whatwere you thinking? !,” or, at best, a funny tale to tell at dinner parties for years to come. Nadia Kennedy had a feeling that her friends Janet and Prentice would hit it off…if she could only get the two together in the same room. Much to her chagrin, the future lovebirds did an excellent job of avoiding each other for well over a year. Nadia was not going to give up easily however, and arranged to meet each of them for dinner at the same place and time one fateful night in 2011. “I was immediately attracted to his easy-going, genuine personality,” Janet said. Prentice felt similarly, “she had the most beautiful and warm smile; I instantly felt comfortable and that I could just be myself in her presence." Five years passed and the couple often spoke about their hopes and dreams of building a life together. Unbeknownst to Janet, Prentice was secretly plotting to design a custom engagement ring and craft a proposal that Janet would never forget. Julianne, his friend from work, sent him my way. 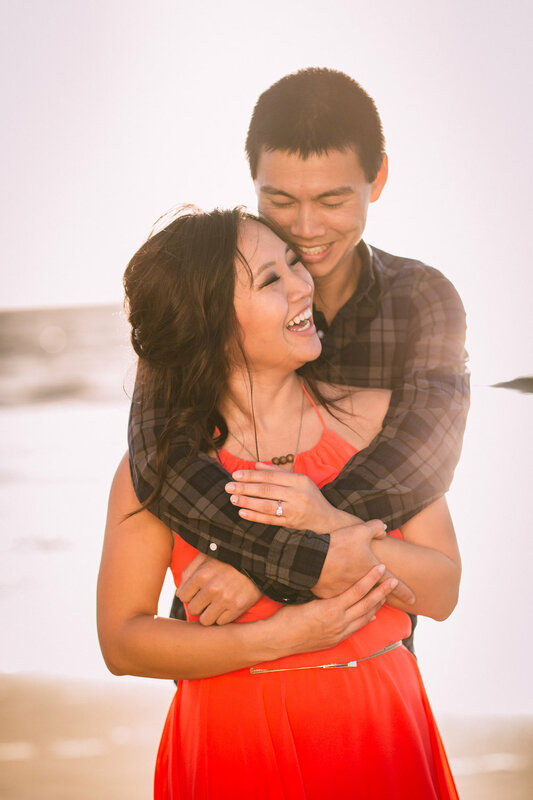 (Click here to read Julianne and Pat’s story. )We hit it off immediately, and a very collaborative process ensued. An imperfectly perfect day: Boba, Bison, and Bling! I had just finished submitting my applications for residency and was lucky to get a long weekend off. Prentice offered to plan our time together and would only tell me that we were having dinner at a nice restaurant one evening. Work kept me from being on time the morning of our proposal, but Prentice waited patiently for me. I tried to coerce him into telling me what our plans were as we drove to San Francisco, but he would only say that we had some time to fill before going to see the bison at Golden Gate Park. Along the way we stopped at Purple Kow, my favorite boba restaurant in SF. We then went to see the bison, but, unfortunately, the bison didn’t want to see us. We opted for Plan B and decided to walk around a nearby lake. It was a beautiful day and I suggested we spend sunset at Twin Peaks (where Prentice had taken me after our first date together). “Coincidentally,” Prentice already knew when the sun would be setting that day, so we headed toward the vantage point when the time was right. As we approached our favorite spot I thought it was odd that Prentice kept driving, but he said he wanted to go somewhere a little less crowded for a change. We eventually found a secluded spot and started our trek up the mountain. Prentice held on tight to me as we battled the gusty wind - my hair was blowing all over my face and I could barely see anything! We made it to the top and enjoyed a beautiful (albeit cold) sunset. As the sun was setting, I remember Prentice saying such sweet things to me, and before I knew it, he was on one knee asking me to marry him! A (very cold) friend of ours was hiding at the top of the mountain and came over to take photos of the special moment. After that, we went to our car and called our family and friends from the parking lot. Quite some time passed before I asked Prentice when we were going to dinner. He seemed to be stalling, but eventually typed the restaurant into his GPS and we headed out. I didn’t know it at the time, but he had typed the wrong location into his phone so that he could surprise me yet again! When we arrived at our real destination, Prentice led me to a gazebo in back where many of my family and friends were waiting to celebrate with us. He and my sister had even flown my mother up from Los Angeles for the party, which was the icing on the cake of an already perfect day. Check out prenticew.com for more great photos. The story doesn’t end there folks, as Prentice had another idea up his sleeve. He had originally wanted to incorporate a medical theme into the engagement ring, but we decided it would limit the design process. Still wanting to celebrate all of Janet’s hard work while in medical school (and not wanting her to lose her newly acquired ring), he decided to design a necklace from which she could safely hang her ring when her duties required jewelry-free hands. This would be his first Christmas gift to Janet as her fiancé. Well, the piece was such a success that I am now crafting and selling the stethoscope-shaped pendant in silver, gold, and platinum variationson Etsy. Best of all, Janet modeled the piece for my marketing materials! As I write this story, I am in the process of designing Janet’s wedding band and ordering a great band for Prentice. I feel so honored to be this lovely couple’s jeweler of choice and look forward to following their love story for many years to come. Newer PostWhy live on the edge when you can jump off it?